Every year, the sporadic E season presents new features and unexpected results demonstrating the variable nature of the ionosphere. In 2003, the 144 MHz very long distance communication between the Canary Islands and central Europe was a big surprise. In 2004 and 2005, we have discussed thunderstorm effects on sporadic E layers, in 2006 we have discovered double hop sporadic E propagation enabled by large rivers, lakes and dams and in 2007, a sporadic E opening has enabled forward- as well as backscatter QSOs at the same time. Joachim (CT1HZE) has managed the majority of dx QSOs on June 5, 2007 (see the graphics displayed on the left hand side). Being the Dubus' editor, he will present latest results of this dx event in the coming issue of the Dubus magazine. I am not authorized to let the cat out of the bag but, yes indeed, this dx event provides a number of surprises. The 144 Mhz sporadic E opening on June 5, 2007 baffled many radio amateurs in south and west Europe. Between 1744 and 1811 UTC, Joachim (CT1HZE, located in south Portugal) managed a number of 144 MHz radio contacts into G, F, ON and PA0 via sporadic E. Around 1811 UTC, he noticed a sudden access to a number of German stations with radio signals affected by slight distortions. The maximum fieldstrength was obtained at the same antenna heading that has enabled the radio contacts to England. At 1813 UTC he managed two more radio contacts towards southwest Germany which he has now interpreted by FAI propagation. Three minutes later (1816 UTC), he was able to access another British radio station whose radio signals did not show any audio distortions, i.e. Joachim has interpreted this contact by forward sporadic E propagation again. In Germany, the transition between sporadic E and FAI has represented a much more drastic change. Initially, Dutch radio stations (all located in the western part of the Netherlands) have managed QSOs with Joachim which has attracted the interest of German fellow hams. Contrary to their Dutch colleagues, the German stations have detected maximum fieldstrength not along the great circle path but at antenna headings 10° to 20° further west, i.e. between 240° and 260° azimuth. In Germany, CT1HZE's radio signal was affected by signal distortions which apparently did not exist in the Netherlands. Between 1841 and 1902 UTC, Joachim worked a number of extraordinary FAI QSOs into Germany representing the longest communication distances in sporadic E backscatter ever observed by European radio amateurs. Around 1846 UTC, Detlef (DK9OY, JO52CK) has received CT1HZE's radio signals (without establishing a 2-way QSO though) over a great circle distance of 2.244 kilometers which exceeds the ham radio world record in sporadic E backscatter by some kilometers. At 1915 UTC, the event faded away, i.e. all long distance communication links disappeared. Thanks to Joachim (CT1HZE), Frank (PA4EME), Guido (DL8EBW) and Udo (DK5YA), I have obtained detailed dx information which has been analysed by using the BeamFinder analysis software. Very surprising results were obtained which will be discussed in detail in the Dubus magazine 3/2007 which will appear very soon. 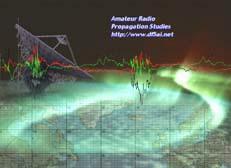 This is an amateur radio web site - written by radio amateurs for radio amateurs. I am pretty much surprised to see that this web site has been referenced and acknowledged even outside of the ham community. For example: The Oulu University, Finland, operates the brilliant Space Physics Textbook in the internet (which is indeed recommended to all readers). I am surprised to see that the chapter ionosphere shows a hot link to this web site. Not only Finish scientists refer to this web site, German scientists in ionospheric research acknowledge our studies and projects too, which is documented by their latest annual report. Even the Wikipedia online encylopedia refers to this site, see the discussion of long delayed radio echoes and skywaves. Many articles publshed on this web site have been translated into various languages. Vladimir, OK1VPZ provides the Czech version of "Unusual Aurora observations in the 144 MHz band". And if you wish to read the article on the "Aurora and FAI dx radius" in Italian language, you are requested to refer to web site of the South Adriatic Ham Community (IQ7ML). Thanks to RW3QKZ, the study on thunderstorm effects on 144 MHz sporadic E propagation is also availabe in Russian language. Did thunderstorms trigger the sporadic E band opening on May 13, 2007? In 2005 we have addressed a never ending dispute in ham radio, i.e. 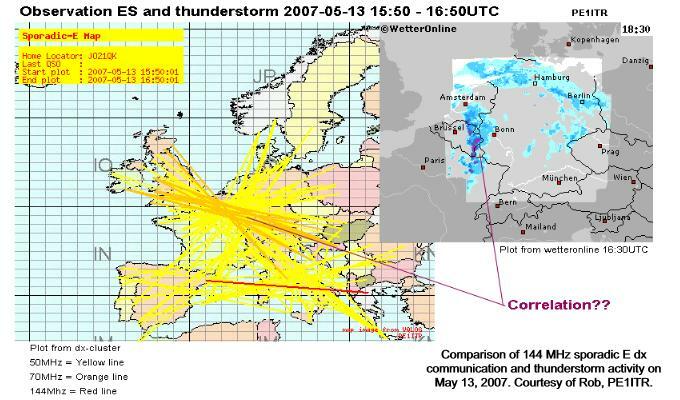 the possible impact of thunderstorms on 144 MHz sporadic E long distance communication. We were reluctant to accept this type of effects but were finally forced to conclude that thunderstorm effects on sporadic E radio propagation cannot be excluded in general. Analysing the June 27, 2004 sporadic E opening we even found a striking geographical correlation between sporadic E and sferic positions - is this an accidential result or does it indicate the generation of sporadic E patches in the ionosphere triggered by thunderstorms in the troposphere? Tropo dx succeeding sporadic E? Oene (PA3CWN) send me an email focusing on the sporadic E band opening on May 29, 2007. Having worked many dx QSOs into Spain corresponding to dx ranges between 1500 to 1700 kilometers, he became became aware of a short-range QSO (around 800 kilometers, or so) managed by Catharinus (PE1AHX) into France shortly after the Es opening has faded out. Oene writes: "I suddenly remembered that I had such an experience before and while chatting with Catharinus, he also mentioned he had experienced this before. To be more accurate, he told me that he had also made some 'good' tropo some 15 mins after an Es opening over the mentioned tropo distance." Oene checked his logbooks back into 1999 and, indeed, he found examples of 800km-QSOs following sporadic E openings by 10 to 15 minutes. Did you make similar observations? Your reports are very much appreciated, please contact the editor by referring to the contact section. Rob (PE1ITR) has now discovered a very similar phenomenon during the sporadic E event on May 13, 2007. He send me the above graphics which indicates thunderstorm cells in close vicinity to the midpoints of the sporadic E radio paths. Rob writes: "is this a correlation or not?" Without referring to detailed data, this question cannot be answered with scientific conviction. However, this observation clearly indicates that the correlation of sporadic E band openings and thunderstorm activity is worth to be examined in more detail. Motivated by this observation, Rob plans to implement thunderstorm data in his sporadic E alert service in the internet. The majority of amateur radio propagation studies presented on this web site focuses on the European dx scene. Quite often I receive emails from U.S. fellow hams and ham radio magazines suggesting similar studies with dx events observed in North America. Yes indeed, I would love to do so because I am conviced there are effects still awaiting its discovery when comparing dx results across the continents. Comparing, for example, Aurora band openings in North America and Europe, we have discovered disprepancies which cannot be properly explained at the moment, see, e.g., the geomagnetic storm analysis available on this web site. VHF radio amateurs are also aware that sporadic E activity in North America and Europe may show very different characteristics between May and September, i.e. high sporadic E activity in Europe does not necessarily imply high sporadic E activity in North America and vice versa (see, e.g., the discussion in the UKSMG forum). However, we are still facing a lack of systematical dx data which could be used in amateur radio propagation studies. Scientific background data such as ionosonde, sferics and upper air sounding data is no obstacle but few information is available from the VHF ham community. There is information, of course, on individual dx QSOs here and there, but this information is insufficient to analyse Aurora, FAI and sporadic E band openings in detail, unfortunately. The internet service Google Earth has stimulated a surprising high public interest in satellite and aerial photography. Ordinary internet users develop into armchair 007 agents by investigating the details of confidential facilities and installations on their home computers. The British news service The Register has even launched the so-called black helicopter competition resulting in tons of photographs displaying military aircrafts, aircraft carriers and submarines all over the world. Being radio amateurs, we are however interested in satellite images of large antennas and we may indeed identify lots of antenna systems around the world. The pictures show the Arecibo Observatory on Puerto Rico, the Northern Cross radiotelecope in Italy (spotted by Goliardo, I4BER) and the I2FAK EME array (spotted by Jurgen PE1LWT), respectively. 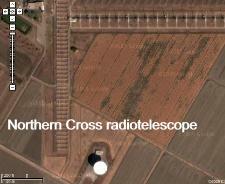 In fact, even ham radio arrays may be spotted in Google Earth's satellite and aerial photography. What is your dx radius in Aurora and FAI backscatter? How much science do we need in ham radio? This web site wouldn't exist without the many contributions provided by fellow radio amateurs around the world. Your input is therefore appreciated at all times. If you wish to make known your latest observations in the practice of ham radio operations, if you wish to publish and discuss your analyses on dx band openings, if you wish to communicate your review of literature dealing with radiowave propagation, you are requested to approach the editor by referring to the contact section of this web site. Do large water expanses enable 144 MHz double hop sporadic E QSOs? Apparently they do. By using satellite and aerial images of the Google Earth internet service, all double hop sporadic E QSOs in 2006 indicate a striking correlation between the position of the QSOs' geographical center and the position of big lakes and major rivers. Do thunderstorms generate sporadic E dx propagation on very high frequencies? An international team of radio amateurs has addressed this question by analysing scientific resources, radio bursts caused by lightning strikes and ham radio dx reports. See our contribution to a never ending dispute in ham radio. On May 20, 2003 radio amateurs from the Canary Islands have worked many 144 MHz QSOs to central Europe and England corresponding to radio path lengths of 3.000 to more than 3.500 kilometers. Surprising results are found in a Sherlock Holmes type of investigation including new ideas on double hop Es. Very special monitor wallpapers await your attention, i.e. space views of the Earth (including the Maidenhead grid system) and the Moon. You may download five versions to be used as background images on your computer screen. The JPEG format, 1024x768 pixels, supports all computer systems. Radio and visual observation of northern lights follow different rules. You may view visual Aurora Borealis anywhere in the sky but you cannot receive radio signals from Auroral backscatter in all antenna directions. Thus, Aurora backscatter is restricted to specific directions in azimuth and elevation depending on your antenna's actual geomagnetic position on Earth. A detailed paper analyses the Aurora and FAI dx opportunities for VHF dxers in Europe and in North America. In August 2005, radio amateurs have managed extraordinary 144 MHz dx QSOs from England and Ireland into the eastern Atlantic which landmarked new tropo records in the IARU region 1. By analysing meteorological sounding data, intense inversion layers are found along the 3.700 km dx path. Tropospheric dx QSOs exceeding the distance of 3.000 kilometers must be considered a true rarity in amateur radio. Analysing this type of dx QSOs (144 MHz to 5.8 GHz) around the world, all this QSOs show systematical features which may be consistently interpreted by a common geophysical process. Having compiled thousands of dx reports from radio amateurs around the world, we may study the global signature of an Aurora band opening for the very first time. See the correlation of 144 MHz dx QSOs with the Interplanetary Magnetic Field and other results which have never been communicated before.